"You don't need to go down there," the tour guide said with a wave of his hand. "Yes I do. I want to see up close. I want to be a part of it." I insisted. The guide, who had been satisfied with looking from the street above, reluctantly led Tim and me down the stairs, along the narrow sidewalk, and to the place where the crowds were removing their shoes. Tim and I left our shoes with the piles of worn sandals and joined the throng of people walking on sacred ground. 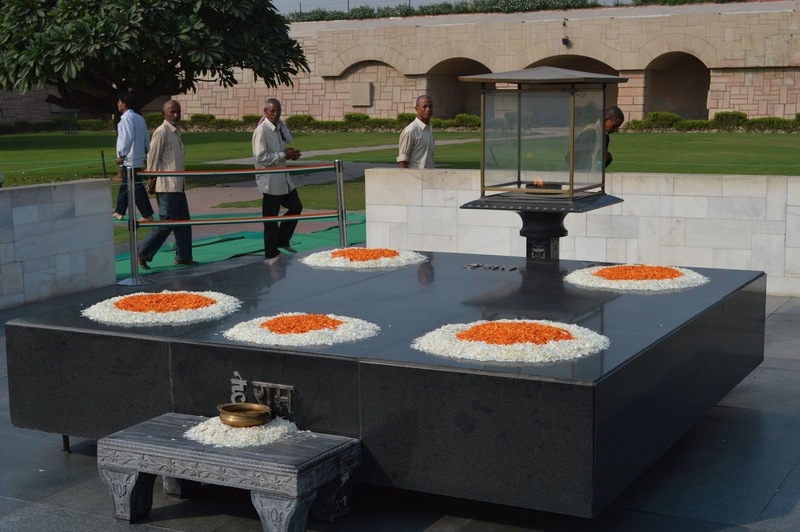 Walking quietly to Raj Ghat—Mahatma Ghandi's final resting place. We followed an old woman. Her long gray hair braided, her sari worn, her back bent. At the platform, she reached out and gently touched the smooth, black marble. Her hand then moved to her lips, her heart, and head. I looked around. Circling the large marble slat were Indians of all ages. Men in faded dhotis, their faces lined with age. Children in their blue school uniforms. The girls with their long braids looped and tied with ribbons. 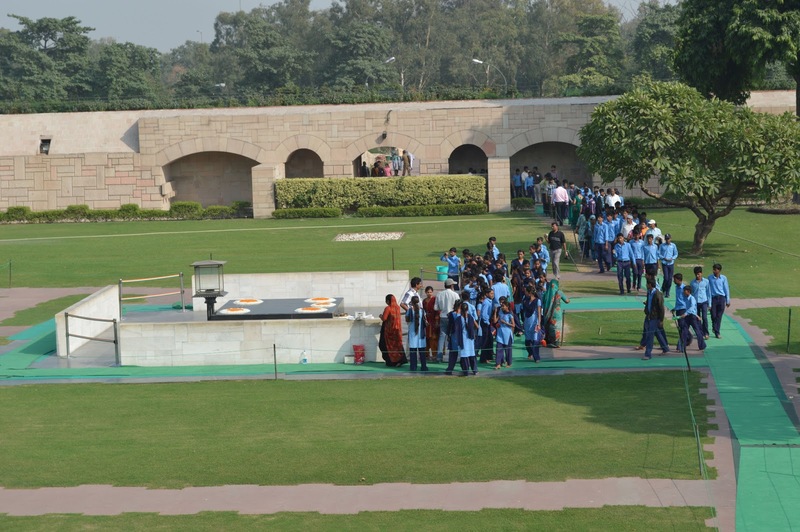 Families holding up their little ones to see Gandhiji's final resting place. Women in saris of all colors: turquoise, pink, yellow, jade green, royal blue. The young women's backs were straight and their gait graceful. The old women's backs were hunched, their tired feet shuffled. One man, missing a leg, rocked forward in a slow rhythm. He swung his crutch forward and caught up with the crutch on the second beat. As each person passed the monument, they paused momentarily to touch the holy platform then touch their lips. The crowd moved slowly as if no one wanted to leave this place as peaceful as the man it honored. 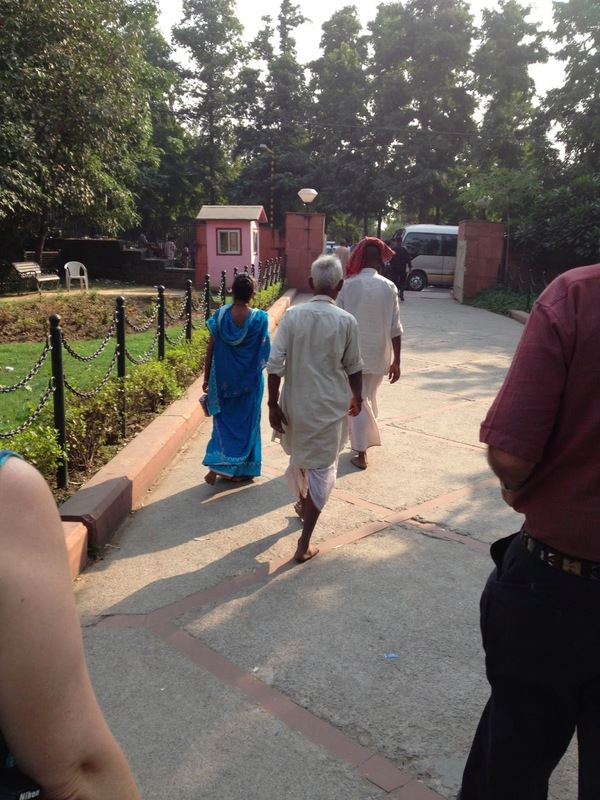 As we walked back to where we left our shoes, following the people of India, Tim and I squeezed each other's hand. "This place, this country is good," I thought.